Razia is a 44 years old home maker who had undergone a C-Section surgery to give birth to a baby girl. After her operation, she started to feel pain in her lower abdomen but she thought it was because of her surgery. She went to a local hospital for checkup and the doctors diagnosed her with RT Ovarian Cyst which is growing larger with time. The growing cyst has become dangerous due to its complex nature and it is pushing away the ovary out of its place and pressing against the bladder, causing frequent urination. If it is not treated immediately, it can cause a painful condition called ovarian torsion which will force the ovary to become twisted. Doctors have advised her for a surgery but she doesn’t have the financial ability to pay for her expensive medical treatment. Her husband is an Asthma patient himself and cannot work due to his breathing difficulty and chest pain. She is the mother of 2 daughters and 2 sons. The elder son is married and lives separately with his wife. The other son is 18 years old who is struggling day and night to get a job to help his family financially. Even in her bad health, Razia is working as a sweeper at and earns about 20,000 PKR per month. Within this income, she manages all the household expenses, pays her rent and buys medicines for her husband and herself. They live in rented house and have no property of their own. Razia is now registered with Transparent Hands and she is scheduled for her surgery in a few days. 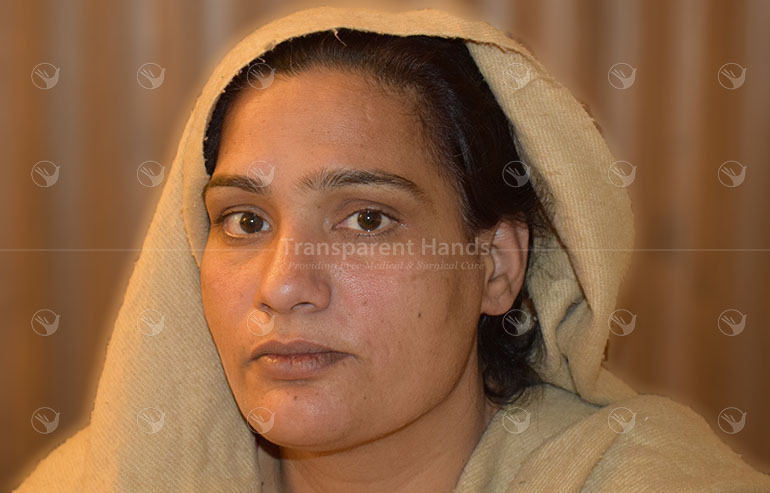 Please make a donation for Razia Shaukat’s surgery to give her permanent relief from living a painful life!